Looking for the perfect treat to bring to a summer get-together? 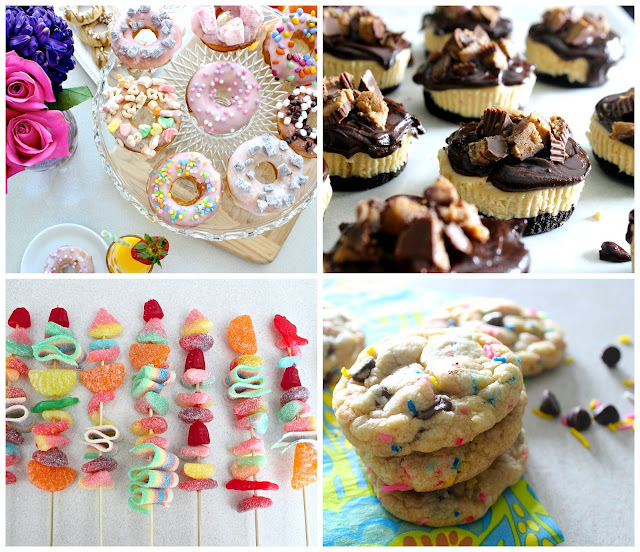 Today I'm rounding up some of my favourite past posts that are perfectly sweet for the season! Take it up a notch with a donut and mimosa themed brunch, or completely wow your tasters with these decadent mini peanut butter cheesecakes. Looking for something less chocolatey? I love making these candy kabobs this time of year! They take my right back to my childhood summer day. And of course I can not leave out these cake batter chocolate chip cookies, they are actually my favourite (check out the original post to find out how we chowed down on these babies last summer). What is your quintessential summer treat? Those candy kabobs look like a fantastic summer treat! I can imagine munching on those by the pool...with a glass of sangria of course! Yes, Kris- totally! They are pool party perfect!